We will post a different planner topic each day for the week of July 27 – July 31. This page (www.franklinplannertalk.com/shareweek) will be updated daily with the newest topic. Respond to the prompt based on your personal experience using a planner. All topics may not apply to you. Each response must be 100 words or more. Submit your response in the provided form by midnight that day. Each day one winning entry will be selected and announced the following day on this page. 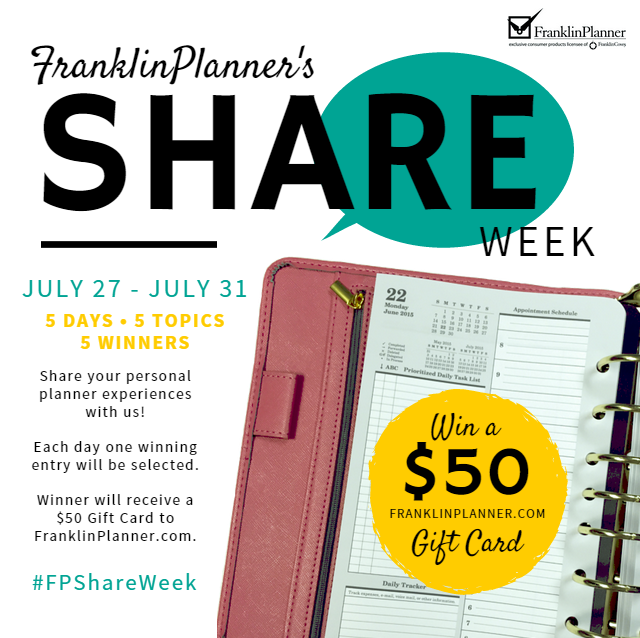 The winner will receive a $50 gift card to FranklinPlanner.com! Follow us on Facebook, Instagram, Twitter and #FPShareWeek for regular updates throughout the week. We look forward to hearing from you and happy planning! *By clicking “Submit Survey”, you agree to allow FranklinPlanner to use your name and entry for future marketing and publicity purposes. July 30: Made it your own? How have you taken the Franklin Planner and made it your own? How have you personalized your planner? July 30 winning entry: To be announced! As life changes, your preferred planner format can change. Have you switched between a daily and weekly layout? Tell us how you’ve used different formats based on your phase of life. “I love Franklin Planners, I have switched to using three different formats. I began with a weekly view when I was in school, that was all I needed. In fact back then I used a weekly spiral bound, mainly because I needed something thin and very portable. I would keep myself on top of my class work by writing when papers were due and important dates for class work. Actually my school mates would contact me about when work was due, since I had everything organized and prioritized in my spiral planner. A little later in life I needed a ring binder with a 2 page daily view. I had three daughters that all played fast pitch, had school activities, birthday parties, games doctors appointments everything for their busy lives went into my planner… Now my life is all about work and I need that view of what is coming up throughout the week without turning the page seven times! I use the pagefinders for appointments that makes my life so easy I have 4, 6 and 8 weeks marked and ready! I would have never made it through life without my Franklin Planner!” – Dyann C.
July 28: Retired and still planning? Are you retired and still using a planner? As your schedule and routines have changed, how has your planning changed? Do you use a smart phone/tablet AND a planner? How do you use both? How are they better together?